The Mercedes-Benz CLS-Class is a sleek sedan with suggestive roofline and an advanced engine. The 2019 CLS refines the automaker's design language and serves as the debut platform for its new 3.0-liter inline-6 engine paired to a 48-volt mild-hybrid system aimed at dethroning Audi and others. The CLS finds its closest competition in other slinky four-doors, including the Audi A7, BMW 6-Series Gran Coupe, Tesla Model S, and the Jaguar XF. Redesigned for the 2019 model year, the Mercedes-Benz CLS-Class retains its evocative profile, albeit less busy slab sides than before. Its front fascia has been brought more in line with the rest of the automaker's lineup with crisp detailing and a grille that's droopier in photos that it is in person. At the rear, the CLS-Class gains edgier taillights that stand in contrast to the outgoing model's softer units and its trunk lid extends further back for a more conventional feel from certain angles. Inside, the CLS-Class feels more like the brand's flagship S-Class than the mid-size E-Class sedan on which it's based. Available dual 12.3-inch screens under a single glass panel give it a proper virtual cockpit look. With its aggressively arched roofline and flowing design, the CLS strikes a balance for those who want a little more versatility for carrying backseat passengers compared to the Mercedes-Benz S-Class coupes, but who don't need the room of an E-Class sedan. It's just a little tight inside; the low roofline steals head room, especially in the snug-fitting back seat, but it's good enough for occasional use or carting the little ones around. This generation offers more room in the rear for actual adults, improved ingress and egress, and three can now fit back there instead of just two. However, practical buyers will still shop for an E-Class instead. After all, the CLS-Class is about swagger, not about cubic feet of storage. Under its hood, the CLS debuts for 2019 with a a pair of powertrain badged CLS 450 and AMG 53. Both feature a twin turbocharged 3.0-liter inline-6 paired to a 48-volt mild-hybrid system. Both the inline-6 and the hybrid setup are new for the three-pointed star and they combine for better efficiency and performance. The engine is good for 362 horsepower and 369 pound-feet of torque in the 450 models. 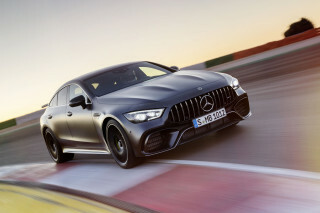 The AMG 53 model adds an electric supercharger and larger turbos to put out 429 hp and 384 lb-ft of torque and it's just as complex as it sounds. But, power is power and that's just fine with us. In both versions, the electric motor adds 21 hp and up to 184 lb-ft of torque, mostly at low rpm. it can also power the car under light load conditions. The lone transmission is a 9-speed automatic. Both rear- and all-wheel drive versions of the CLS 450 are on offer; the AMG 53 comes only with all-wheel drive. Suspension choices include steel coil springs with adjustable adaptive dampers or an air suspension that can raise and lower the car and offers adjustable firmness. The CLS offers a smooth and composed driving experience with any setup, though the AMG 53 model has sharper moves. The CLS is loaded from the factory with safety tech, including forward-collision warnings with automatic emergency braking. 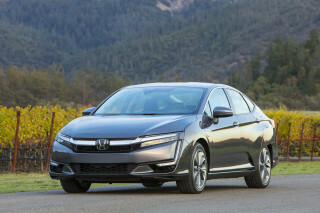 Also offered are adaptive cruise control, blind-spot monitors, and active lane control. It will even use navigation data to automatically adjust its speed to safely handle bends, roundabouts, junctions, and toll booths. In its first generation, the Mercedes CLS-Class was sold in the U.S. from the 2006 model year through 2011. The CLS is the model that defined the somewhat nonsensical "four-door coupe" category as a sedan with a coupe-like silhouette and dramatic styling. The CLS was a bold design statement when it launched and the first-generation car managed to look modern until it was replaced. While the interior and underpinnings of the first CLS were closely related to the E-Class sedan of that time, the big difference was seen in the rear seat as a result of the extremely tapered roofline. In place of a standard bench seat, Mercedes fit two small bucket seats in the rear, which were comfortable for smaller folks but didn't provide enough headroom for tall adults. The design also hindered rearward visibility, with thick rear pillars and a short backlight. The first CLS was built on most of the same mechanical underpinnings as the pre-2010 Mercedes-E-Class sedan. It was introduced as a CLS500 or CLS55 AMG—the CLS500 including a 302-hp, 5.0-liter V-8, the latter a 469-hp, 5.5-liter V-8. In 2007, those models were replaced by the 391-hp, 5.5-liter CLS550 and the 507-hp, 6.3-liter CLS63 AMG. Any of these models had the capability to accelerate confidently and smoothly from any legal or extra-legal speed and come with a responsive 7-speed automatic transmission. AMG models came with paddle-shifters and were sports-car quick; the CLS63 AMG could get to 60 mph in less than 4.5 seconds. In any of these versions, fuel economy was unimpressive: low teens in the city, mid to upper teens on the highway. Overall, the CLS rode and handled more like a luxury car than a performance sedan; despite an air suspension in most versions, it had quite a bit of body motion when driven quickly. The CLS63 AMG version handled considerably better, without riding any worse. Powertrains aside, the CLS-Class changed very little from its 2006 introduction through the 2011 model year. The model got an updated grille, new wheels, and a few other small changes for 2009, along with the latest version of Mercedes-Benz's Comand navigation and entertainment interface. Interior appointments were excellent in this generation, with more colorful and daring interior themes than M-B used in its other vehicles. Completely redesigned in 2011 as a 2012 model—and including an AMG model at launch—the CLS-Class still rode atop the same architecture. It grew a bit longer, though passenger space remained similar, and trunk space was slightly reduced. The shape was even more dramatic than before, with the blocky, masculine front end then common on the Mercedes lineup fitted to a body with more crests and curves. The ponton flares stamped into the rear quarter panels were especially distinctive, while the heavy-lidded taillights may have been the least inspiring detail. The CLS's interior was positively bejeweled with chrome trim, and accented with beautiful wood or aluminum, depending on the model. When the second-generation CLS was first offered in 2012, it was available with a choice of three powertrain combinations. The CLS 550 used a downsized turbocharged 4.6-liter V-8 good for 402 horsepower and matched to a paddle-shifted 7-speed automatic transmission. It was capable of a 5.0-second 0-60 mph time and a 130-mph top speed. The same engine was also offered with all-wheel drive, as the CLS 550 4MATIC. The performance version, the CLS 63 AMG, fit a 5.5-liter twin-turbo V-8 and a clutched 7-speed automatic transmission under the polarizing body, providing up to 585 hp, a 0-60 mph time of as little as 4.3 seconds, and a top speed as high as 186 mph. For 2013, a new telematics system was fitted to the CLS, bringing with it apps including Facebook and Yelp connectivity, plus remote vehicle access and diagnostics, and an mbrace Concierge service that helped customers book airplane tickets and make dinner reservations, among other tasks. In 2014, the AMG CLS was updated and given a lengthier name: CLS63 AMG S-model 4Matic. The S-model portion denoted a more powerful version of the 5.5-liter V-8, which now make 577 hp and 590 lb-ft of torque. The 4MATIC addendum signified—and still does—standard all-wheel drive. In the 2015 model year, the CLS was updated with a new front end that was less busy and more subtle than its predecessor. The cabin also was updated with the latest, cleaner Mercedes themes. Switchgear was updated inside, bringing the CLS back to the level that its E-Class relatives enjoy. There were several powertrain updates for the 2015 CLS. Mercedes added a CLS 400 model, which used its new twin-turbocharged V-6, good for 329 hp and 354 lb-ft of torque; rear-wheel drive was standard with this engine, and 4Matic all-wheel drive was available. The rear-drive CLS 550 received a new 9-speed automatic transmission, which saw expanded use in other CLS models and the rest of the Mercedes-Benz lineup in the 2016 model year. The CLS 550 fitted with 4Matic all-wheel drive continued to use the older 7-speed automatic. For 2017, the CLS 400 received the same 9-speed automatic. 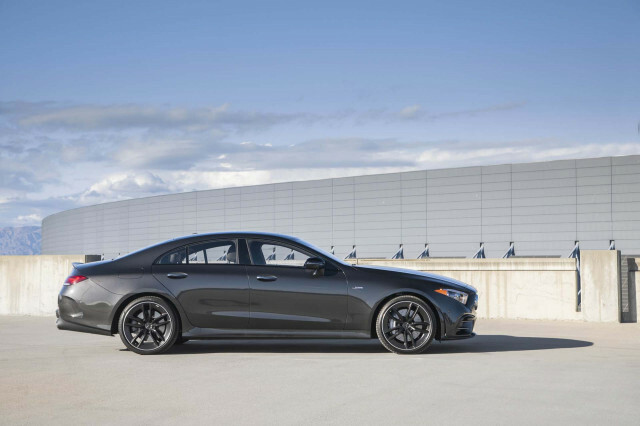 The 2018 model year brought back only the CLS 550 and the CLS 63 AMG in anticipation of the new 2019 CLS that debuted at the Los Angeles auto show in late 2017. Distinctive, classic design. Perfect construction quality. Air suspension deal with all surface conditions faultlessly. Superb 4.7 litre twin turbo V8/state of the art 9 speed auto is seamless and abundant... Distinctive, classic design. Perfect construction quality. Air suspension deal with all surface conditions faultlessly. Superb 4.7 litre twin turbo V8/state of the art 9 speed auto is seamless and abundant with power. Godd car, harsh ride on bumps. It is time to increase the horsepower and improve the ride on rough surface. Otherwise it is a great car. Car is awesome after 2 years of driving. It does everything well and have no issues with the vehicle. We have had many Mercedes and this car was the nicer as a daily driver than the E63 we had. We are fans and will suggest to anyone for the value. It does everything well and have no issues with the vehicle. We have had many Mercedes and this car was the nicer as a daily driver than the E63 we had.